Combustible dust explosions are a risk in many areas of a plant, but one of the most common locations is the dust collection system. 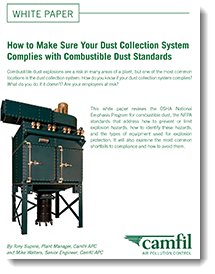 How do you know if your dust collection system complies? What do you do if it doesn’t? Are your employees at risk? Download this free whitepaper, sponsored by Camfil, to learn more.